The short game features many shots with many swings with many clubs. All the possible combinations leave golfers unsure of what to do when facing any given shot. This uncertainty leads to playing the same shot in different ways with no reason other than “it didn’t work last time, so I’ll try something different this time.” A reliable short game needs a firmer foundation than that. Let me suggest a short game plan that takes the uncertainty out of your club selection, often the critical factor in hitting a successful short shot. There are two ways you can look at club selection, and I am going to call them the the iron method and the putter method. The iron method follows the logic that a set of irons contains clubs that have different lofts which enable a player to hit the ball different distances with the same swing. Likewise, if the stroke you use for a particular short shot can be kept the same every time, distance can be controlled by using the loft of different clubs. The iron method eliminates the stroke as a variable. The putter method is the opposite. It’s based on the notion that you putt with only one putter, regardless of the length of the putt. You control the distance of the shot by varying the length of the stroke, or its firmness, or some combination of the two. Applying this logic to the short game, you would use the same club every time and vary your stroke to hit the ball the required distance. The putter method eliminates the club as a variable. Dividing the short game into four basic shots, (the greenside chip, the chip from past greenside to twenty-five yards, the short pitch from twenty-five to fifty yards, and the standard pitch from beyond fifty yards), you can hit each one using the iron method or the putter method. It is up to you to decide which approach you want to take, then learn to hit each shot with a particular method and stick with it. 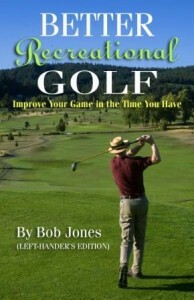 Your local PGA pro can help you with this. 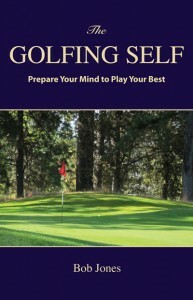 You will play better golf if you can reduce the number of decisions you have to make as you play. The less thinking you have to do, the better. Here is one way to simplify the short game along those lines. 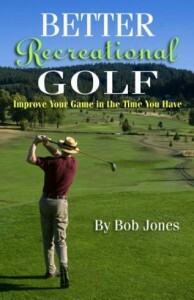 Note: If you go to my Recreational Golfer website (below), and sign up for my monthly newsletter, you can receive an extract from my book, Better Recreational Golf, that explains the four basic shots in detail, free.